After gaining some experience at coding, the EU Digital Girl of 2014/15 and young speaker Lauren Boyle became a mentor at her local club, helping other students and sharing her knowledge. She has now developed a number of successful websites and apps, and has helped launch the Hour of Code with Prime Minister Enda Kenny and was recently interviewed on the Late Late Show. 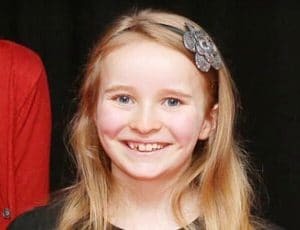 The ten-year old speaker Lauren Boyle from Dublin began coding after joining her local CoderDojo club in 2013. After gaining some experience at coding, Lauren became a mentor at her local club, helping other students and sharing her knowledge. Lauren has already developed a number of successful websites and apps. One of these promotes healthy eating, while another looks at life skills for kids, such as how to make friends and how to deal with bullying. This website, Cool Kids Studio, saw Lauren win prizes in the Coderdojo Coolest Projects Awards in both 2013 and 2014. Lauren has developed Cool STEAM Kids; an app and website encouraging 10 to 15 year olds to try science, technology, engineering, art and maths. 2014 was a big year for Lauren. Having won an award for Excellence in the Next Generation category at the IEDR’s Dot IE Net Visionary Awards, she was also named EU Digital girl of the year and received her award in Rome. Following this prestigious win, the vibrant speaker Lauren Boyle took part in a panel discussion at the Web Summit for Schools and met a number of high profile people, including Minister Damien English in the Dept. of Education. Visits to Google, Twitter and LinkedIn to name a few saw Lauren talk about her web projects, her love of coding and technology and the importance of role models in science, technology, engineering and math (STEM) for young people. The year ended on a high note, when Lauren Boyle helped launch the Hour of Code with Prime Minister Enda Kenny. She was also delighted to be included on lists such as The Journal’s 20 under 20 and Silicon Republic’s TopTech Newsmakers of 2014. All this success has not stopped our juvenile speaker Lauren Boyle from planning some exciting future projects, which include continuing to develop her coding skills and learning more programming languages. After her meeting with the Department of Education and Skills, Lauren is eager to see life skills included in the primary school curriculum and she also plans to continue promoting STEM to young people. Furthermore, Lauren also finds the time to play the violin and practice learning Mandarin Chinese and Spanish. In 2015, Lauren Boyle spoke at Accentures International Women’s Day, and won the Creative Web Coding category at the Eircom Junior Spiders awards. Additionally, Lauren spoke at the Web Summit for Schools and at the main Web Summit event on the Peoples Stage. Furthermore, she spoke at Accentures International Womens Day Conference in March 2015 followed by Silicon Republics Inspirefest where she gave a keynote speech. Lauren recently spoke at Salesforce’s annual conference Dreamforce in San Francisco.